1956's FORBIDDEN PLANET. A masterpiece of science fiction cinema. Has anybody out there ever seen this one? It is a classic. Great visuals, great soundtrack, great story. FORBIDDEN PLANET centers around the mysterious planet, Altair-4. It seems that an ancient alien race, the Krell, once inhabited the planet millions of years ago with a technology vastly superior to ours....but some mysterious force wiped them out. A team of researchers from Earth led by Dr. Morbius colonized the planet. They were all massacred one by one by some terrible entity. Dr. Morbius and his daughter are all that remains, and they inhabit an ancient fortress built by the Krell. He is the sole protector and student of the Krell's technology, which is still present and completly operational. Another team from Earth comes to visit the planet and find out what happened to the missing researchers. Dr. Morbius pleads for them to leave, because terrible things are bound to happen to them.....of course they don't listen and all chaos ensues. What is causing all of these deaths? Well, it is creatures from the Id of course......and nothing can stop them! This movie is beautiful to look at, with futuristic sets galore. Also, the soundtrack by Louis and Bebe Barron is incredible...it is the first movie to use the moog synthesizer and theremin to full effect. I highly reccomend this one. Here's some of the soundtrack. Is there anyone out there who hasn't seen Forbidden Planet? If so, why are you looking at blogs when you should be watching it? 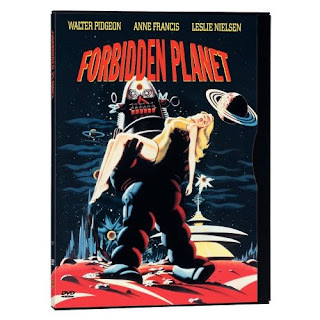 Forbidden Planet - one of my top ten favourite movies of all times / genres. So good it's amazingly brilliant.